Armello is a unique game, to put it simply. It’s a game of chance, battles, prestige, and glory. And also death. If you are into strategy, magic and lore, then you should probably check out this game. Now let’s get started. The simplest way to tell you about Armello: There’s a king. You’re the leader of a clan. The king is sick, and whoever kills him becomes the king. You want to become king. But so do the other clan leaders. Queue the race for kingship via murder and control. It’s like a digital board game battle arena with a questing system and card system to help magnify your strengths or expose enemy weaknesses when in battle. The overall map is essentially one big circle, divided into small octagon spaces, and you can travel one space at a time via Action Points. You get 3 each turn, though some actions require more than one AP. Each player (4 max) go through their turns, in an effort to either gain ground by defeating enemy players or claiming small towns for prestige and gold rewards. The king rests in the middle, and he has several guards who generally protect the castle area, but can seek out players if necessary. There are areas for stealth, towns to control (which give you gold and other bonuses), dungeons for exploration, and open land areas. You can also just run straight for other characters, and attack them. You can kill them but you don’t necessarily “kill them” when they are defeated in battle. They will respawn at their base on the next turn. The competitive edge gained is a small ability to reclaim some towns they might have taken from you, and set them back distance wise from you, or the king if they were moving in for the attack. The game is up to four players, and while the multiplayer has both a Skirmish and Ranked mode, I wasn’t able to try either. My first attempts at playing online left me in a lobby for 10+ minutes while the same several people were (probably) also looking for matches, but left the lobby rather than stick it out for a few minutes so it would group 4 of us together. The other few times I tried matchmaking it wasn’t able to create a lobby. That said, the single player game provides plenty of content if the matchmaking side of the game is unpopulated at times. My guess is I’m hitting it at times where maybe there aren’t a ton of players on, as the game just launched recently and it’s also available on other platforms so it’s possible the community isn’t fully flourished on this particular version. The game looks beautiful, runs beautiful (it ran significantly better on my Alienware Alpha than my Macbook Pro 13″ model, just longer load times), and provides hours of content. The strategy involved is fun, and the card playing aspect changes the dynamic of the game as you’re always going to have different battle scenarios which will change up the strategies you have to use to succeed. Not being able to try multiplayer was a bummer (though I’m not giving up on that, I will keep trying), but sometimes the single player vs. AI seems painfully slow. Like, 2am Monopoly with all properties owned and you’re praying someone just wins slow. It’s not so much that it’s slow because of game mechanics, but in that there is SO much content going on that sometimes it feels like a character’s turn takes forever. If the AI has a turn it’s usually very quick because questing and battle scenes don’t show up for me, so no animation to go in (see the above battle picture with the dice). All the animations happen on the overworld/map screen, so the AI turns go pretty quickly. But your own quest choices + battle scenes, night to day transitions with the King’s orders of the day start to drag on sometimes. There is an element of the fact that I personally have been recently playing a lot of “gimme gimme” games where rewards and actions occur at a rapid pace, so I might just not be used to the slower pacing of a strategy game, so I’m not really knocking it down, it just felt slow at times to me. Overall thoughts: I really dig the art style. The game strategies are fun, and the board game style map and movement/action mechanics make for a fun experience when playing against AI, and probably even moreso when playing online. If you’re used to slower, more thoughtful strategy based games then you might not have an issue with the pace, but I personally felt it slow a bit at times. The upside to that, is that it felt slow because of all the content that happens and that I wanted it to be my turn again to continue my quest towards the throne. It’s available on PS4 and while I’m reviewing the PC/Mac version, I did use a controller for a good portion of this and didn’t feel any clunkiness of the PS4 controller versus keyboard and mouse controls. 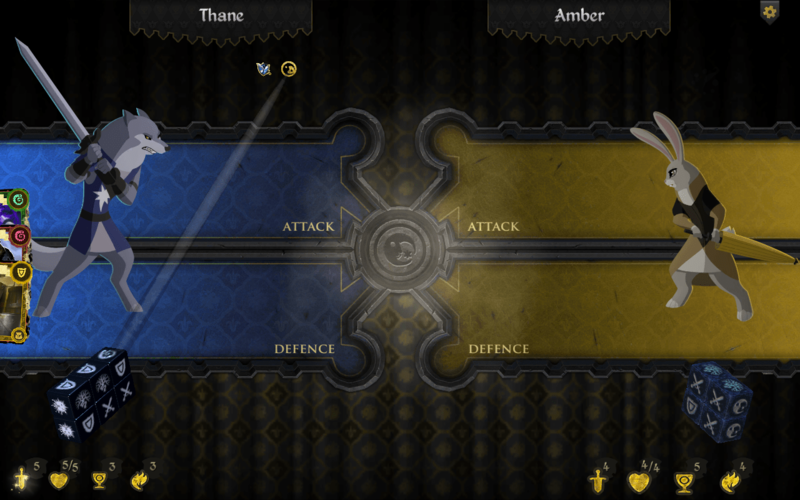 Armello is currently available on Steam (PC/Mac/Linux) and PS4 for $19.99. ZergID MMO Network Hits A Half-Million Users!